As the classic book nerd I am, I constantly hunt for new (or old) titels to add to my “libary”. 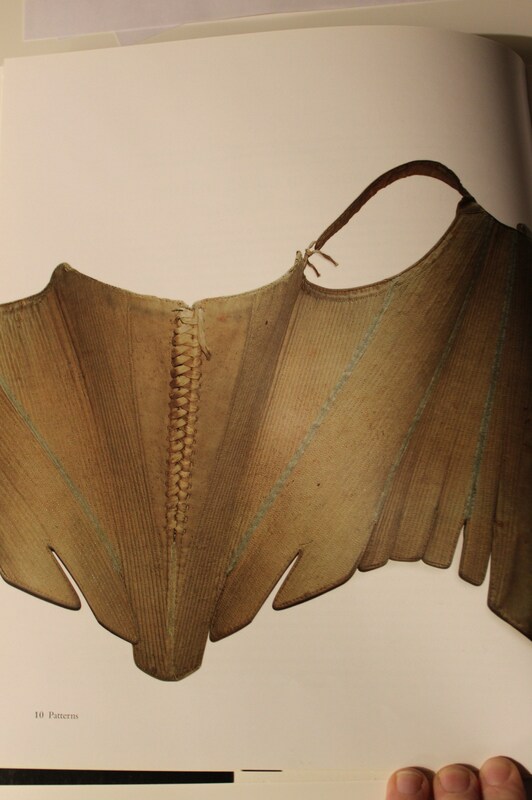 I love the feeling of flipping through a well reserched costume book, just as much as I love droling over the beautiful ones made for the coffee tables. And as such a sucker for book-candy I also love to read about and find new wounderful titles. 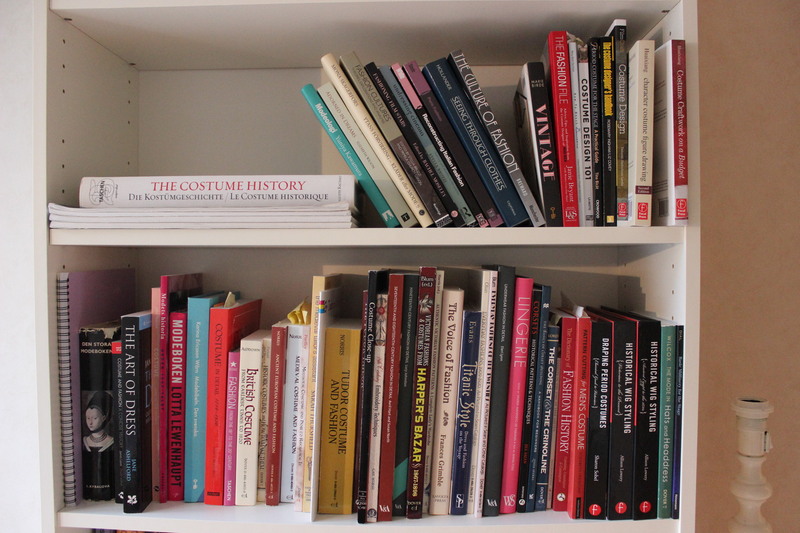 In my town (and probably in the rest of Sweden) it is really had to find good costuming books at the store/libary. So often you need to buy the book on-line, and don’t get the chans to flipp through it before deciding. Most often I just read the reviews on Amazon before I buy a new book on-line, but since I love when fellow costumers recomend a title I decided to try to give some back. So this post will be the first in a series of reviews. And the first book will be a “old goodie” that I’ve had lots of use of. 23 patterns (including 1 pregnancy stays, 1 child and 1 dolls corset). Construction instruction for 2 different corsets. Prize: About 200 sek (45Usd). The book is very beautiful and contain lots of great patterns. 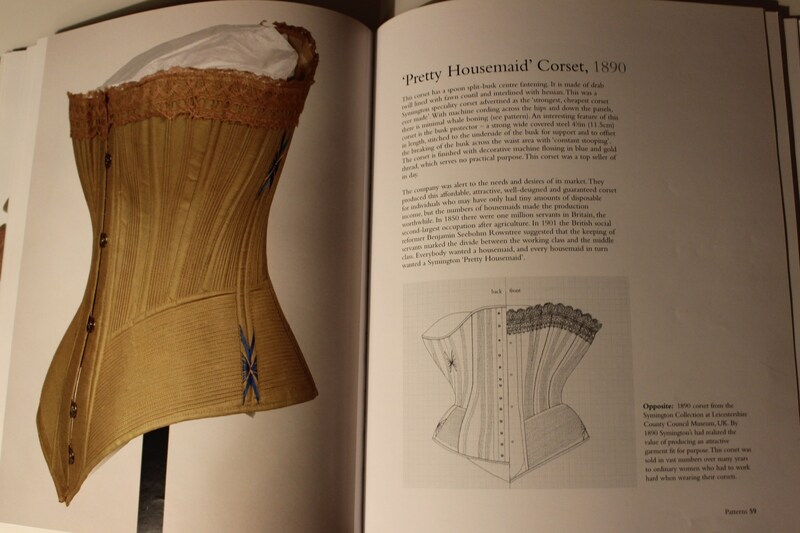 The layout have a nice and clear way of showing both the real corsets, the descriptive texts and the patterns. The pattern are pretty easy to scale to full size using the chekered background as a guide. I scanned the pattern to my computor and then printed it to the right size. So simple. 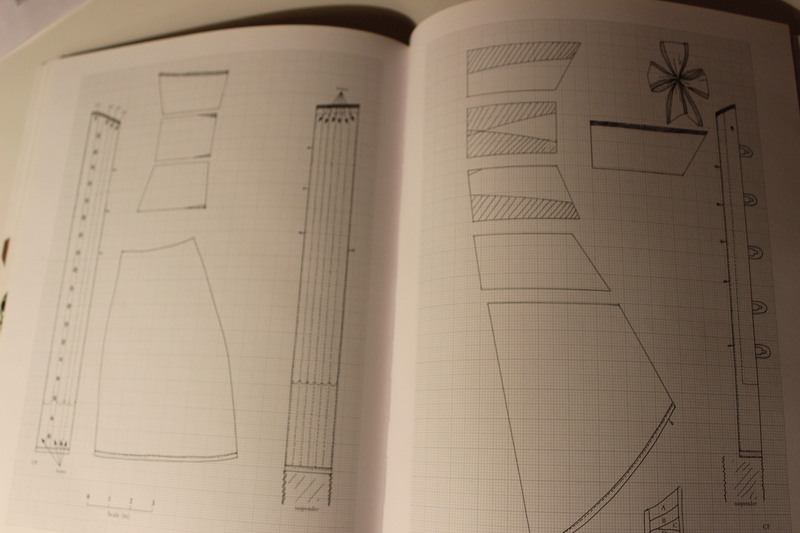 I’ve used two or three of the patterns in the book and found them to work very well (but you might have to do some heavy scaling to take in account our larger modern body size). 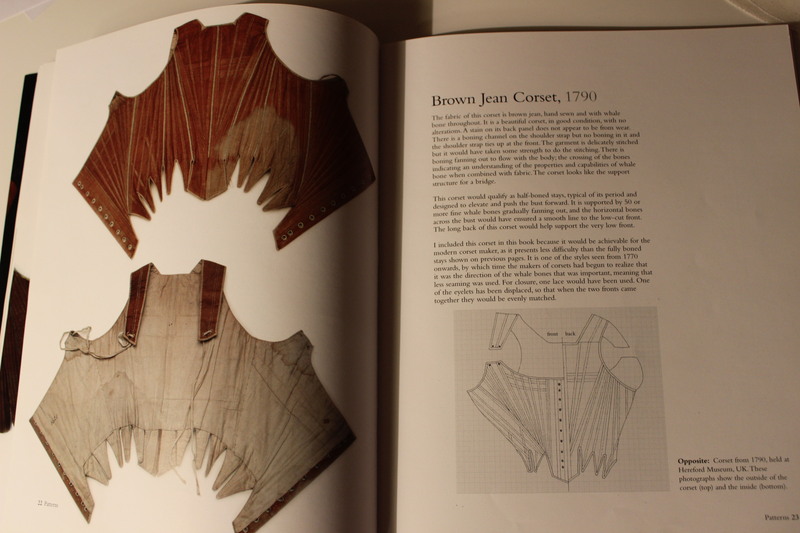 Both of these corsets are made with the “Brown Jean Corset 1790” pattern. The one to the left is in original size (really, really smal), and on the right one I have moved the lacing to the back and adjusted the fitt a bit more to my sisters body. (If you look at the different shoulder positions of her body you can really tell the different between the “original” pattern and the adjusted one). I think the information about each corset are nice and informative and give a good feel for what kind of person would wear the particular item. Like in what way was it worn, and what did the wearer do while wearing it (work, stay at home, dance ect.). 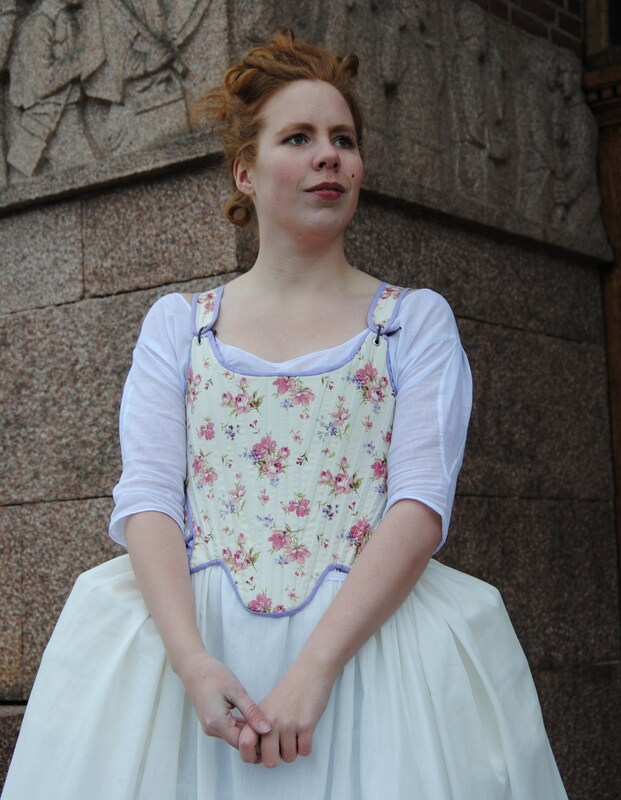 This corset is one of my first ones, and are made using “Pretty Housemaid corset 1890s”. The fitt is good but the sewing and assembly of it was really tricky to figure out. 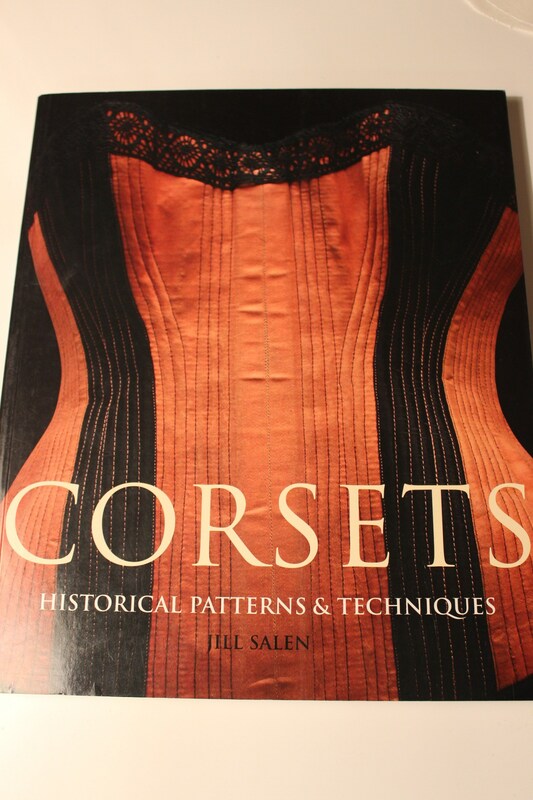 I learnt a lot of new things about corsets and the way people of the past lived from this book. (Did you know that smal children made their first practice corset to fitt their dolls, then later moving on to the “real stuff”). I really do love the book but do think it have some flaws. I for one think the choise to include the patterns for 3 ribbon corsets, 2 childs and 1 dolls corset is a bit strange. Even though I understand the desire to include lesser known pieces, most of the costumers would want a good variety of patterns and to make them fit a real body. I also think the basic sewing and assembly techniques could use a bit more elaboration. 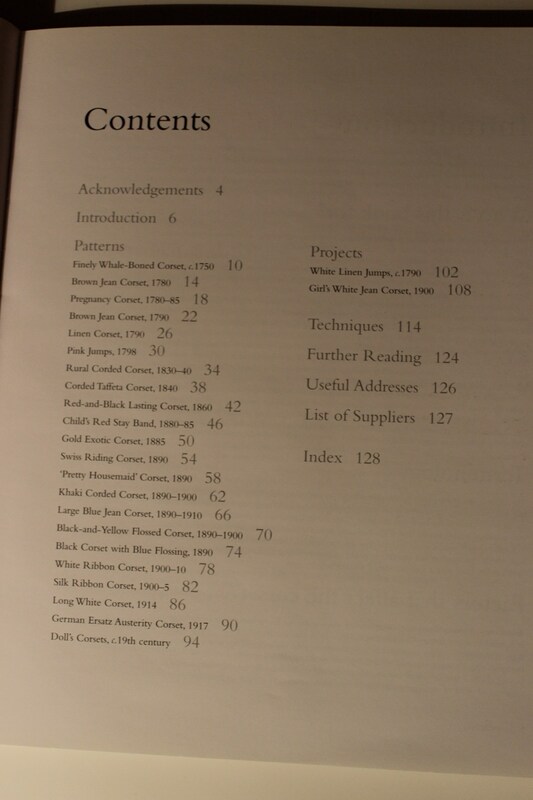 The author do state in the preface that the book is mainly for the “experienced” costumer/semstress, and is not ment to be a sewing book. But it still could have used some more tips and tricks in assembeling the different styles. 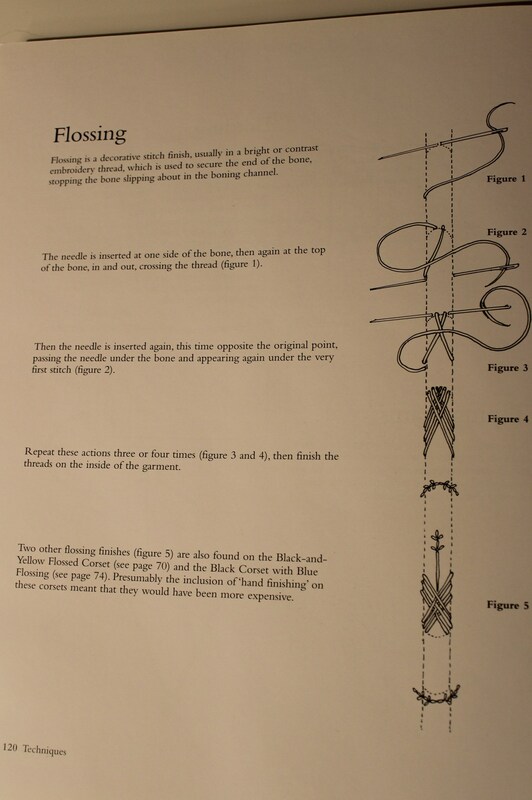 I really like the flossing diagram though. 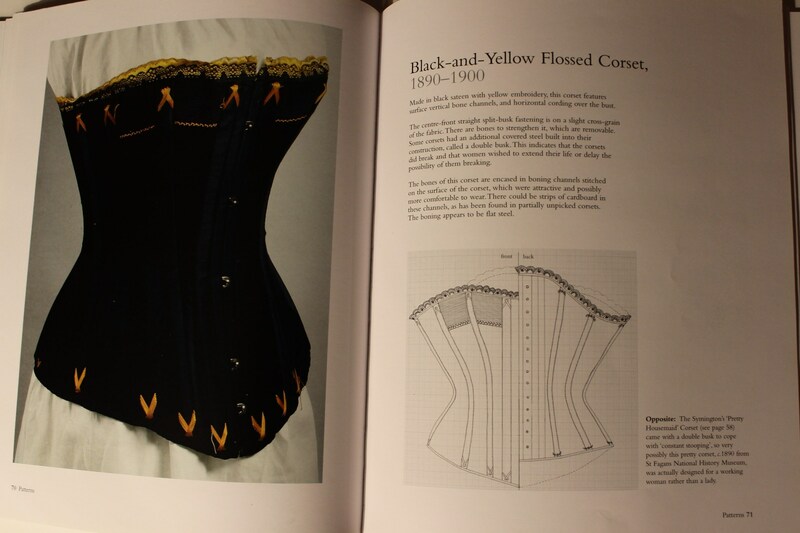 I also would have liked to have the mesurments of the real corset (and patterns) writen out. 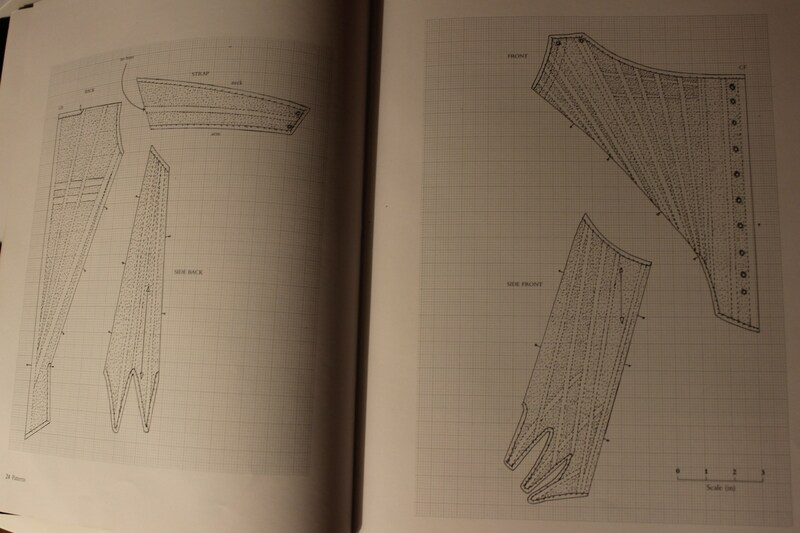 Of course, you can measure the pieces and scale them up to the right size, but it would have been nice to be able to know the aproximate size of the corset at a glance. The book is a lovely addition to any costumers libary. 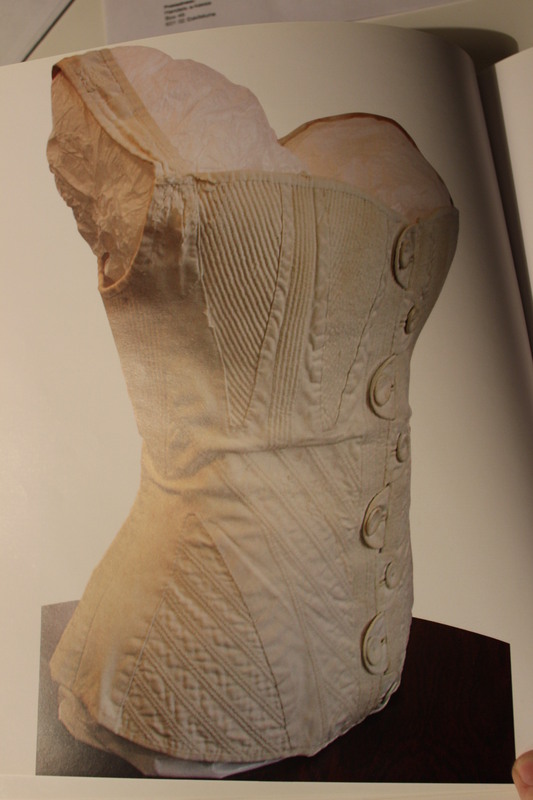 It is a perfect compliment to the famous “Corsets and Crinolines”, but also do very well on its own. 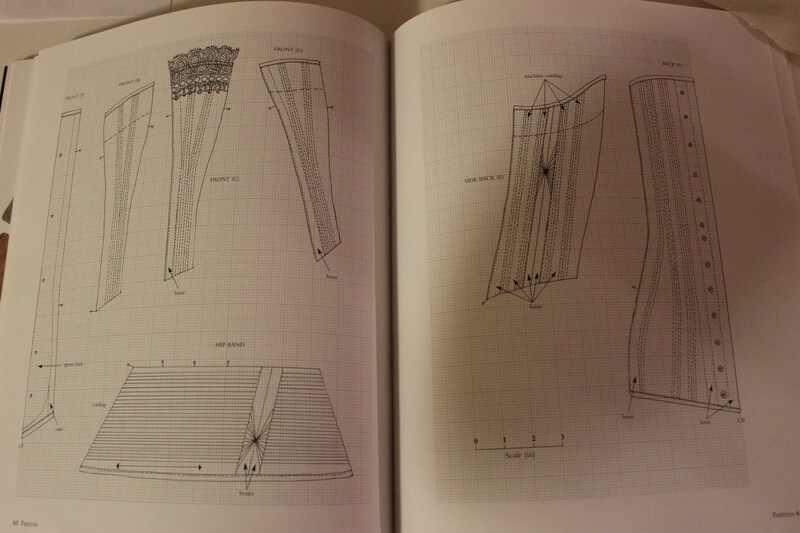 I do think the book is a bit complicated if your not very familiar with corset construction. 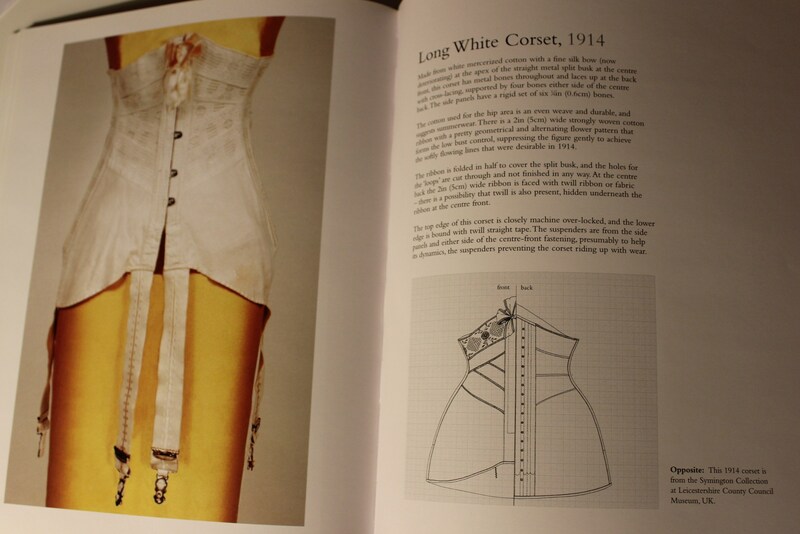 But if you want a pretty, cheap, book about historical corsets – you have found the one. Enligt dateringen i boken är den från 1840, men författaren nämner att den kan vara så tidig som sent 1820-tal. Toppen! Jag tyckte att den såg ut att vara i den stilen, men har aldrig sett något liknande i knäppningsväg, de brukar ju vara stängda fram under den perioden. Men nu kan jag med gott samvete göra en sådan knäppning 😀 Får skriva upp boken på önskelistan också. Hm, läste nu lite mer om den – verkar som om knäppningen fram är en justering som gjorts senare (men det framgår inte om senare i detta fallet är just 1840 eller ännu senare). Ändringen kan ha gjorts samtidigt som öljetter för snörningen i ryggen sattes in. Men hon skriver också att knapphålen verkar vara gjorda med samma tyg som övriga korsetten så justeringen gjordes förmodligen inte allt för långt efter själva korsetten. Thank you!! I have been looking for a comprehensive review on this book. Can you give some indication to the time periods the book covers? 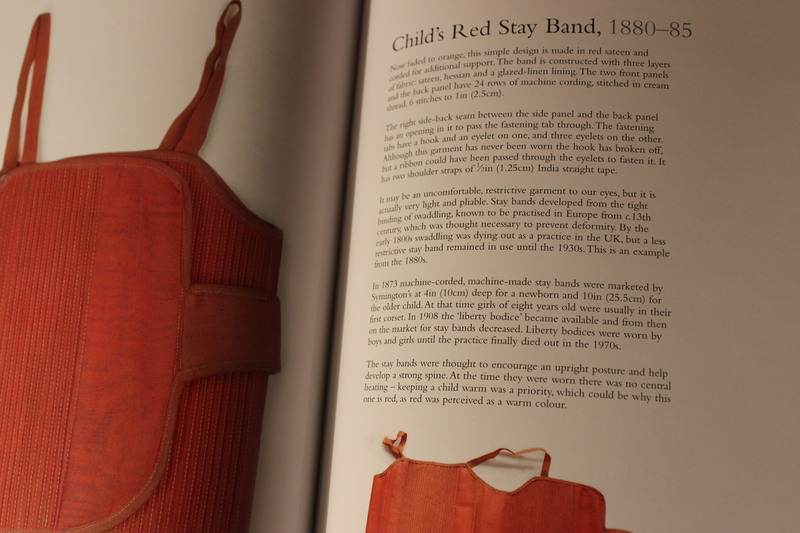 The book covers the period of 1750s to the late 1910s. And I think she have included many of the usual styles, and some styles I never seen before.